The following is an edited transcription. The original documents are an excellent example of repetitive legal verbiage. For centuries the cost of writing legal documents was priced by the number of words written. Consequently verbosity has become an author's economic skill. Just look at your Will. 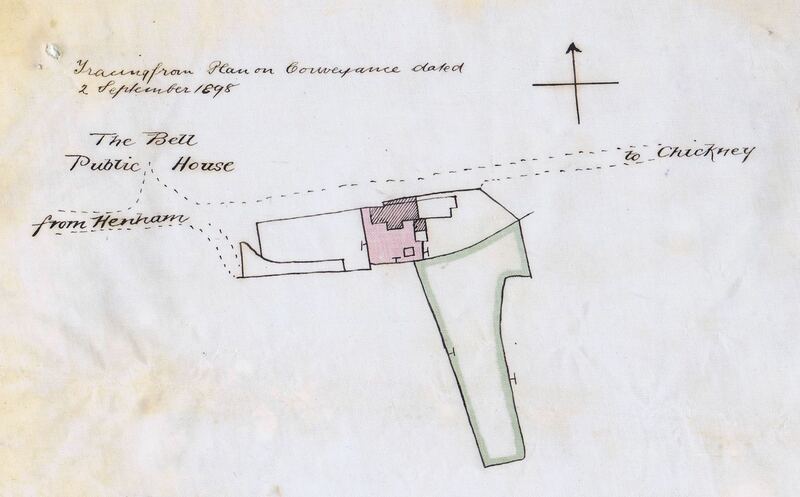 1884 29th Sept. ABSTRACT OF TITLE of Mr. Thomas Wright to freehold hereditaments at Henham in the County of Essex. By Indre of this date made between the Reverend Robert Burdett Burgess of Newport in the County of Essex, Clerk in Holy Orders of the one part and Salisbury Baxendale of Bonningtons in the Parish of Hunsdon in the County of Hertford, Esquire of the other part. Reciting that the said R.B. 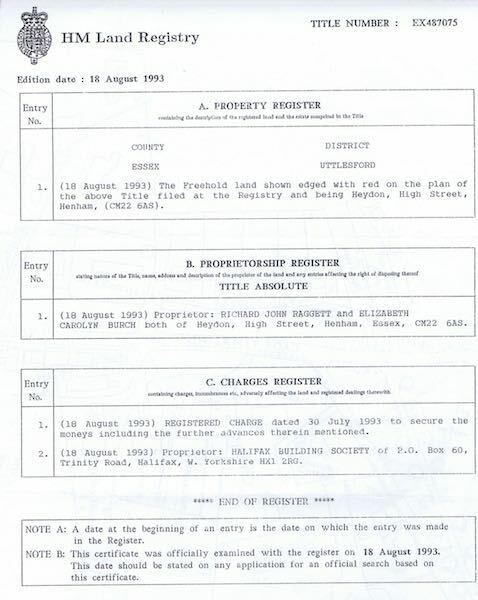 Burgess being seised of or otherwise entitled to the freehold hereditaments and premises thereinafter mentioned and intended to be thereby granted and conveyed for an absolute estate of enhance in fee simple and being seised of or entitled to the copyhold hereditaments and premises therein mentioned and covenanted to be surrendered for an absolute estate of enhance to him and his heirs according to the custom of the Manor of Henham Hall of which the same were holden had contracted and agreed with the said S. Baxendale for the absolute sale to him of the said freehold and copyhold hereditaments at the price of £400 (£300 for the freehold hereditaments and £100 for the copyhold hereditaments). It was witnessed that in pursuance of the said agreement and in consideration of the sum of £300 paid by the said S. Baxendale to the said R.B. Burgess as beneficiary owner did thereby grant and convey unto the said S. Baxendale - ALL that messuage or tenement and shop with the stable and outbuildings, yard and garden thereto belonging situate in Henham in the County of Essex by the side of the road leading from Henham to Chickney and then in the occupation of Messrs. Holland & Barrett AND ALSO ALL THAT messuage or tenement adjoining the last described premises together with the stable and coach house, yard and garden thereto belonging and appertaining then of ... Eggleton both of which said messuages or tenements were converted into their then present state by the said R.B. Burgess but were formerly one messuage or building divided into six tenements and were described as follows that way to say All that piece or parcel of land situated by the side of the public road or highway leading from Henham to Chickney in the parish of Henham in the county of Essex containing in length from east to west on the front and backside of the same 100 feet of assize little more or less and in width from north to south on each side thereof 56 feet of assize little more or less And also a small enclosure of ground situated at the east end of the same containing 14 feet in length and 5 feet in breadth And also All that messuage or tenement then sometime since and then divided into 6 tenements with the barn thereto adjoining and belonging then sometime since erected and built upon the said piece of ground as the same were frequently occupied by John Buckett, Patient Chapman, James Rickett, William Markwell, Joseph Thompson, Henry Mansell and John Fuller and afterwards of John White and others.........R.B. Burgess also surrendered to S. Baxendale All those two messuages or tenements and cottages situate in Henham aforesaid adjoining the above described freehold premises together with the yards and gardens thereto belonging or appertaining and then in the occupation of Richard Willett and William Dixon and which said messuage and premises were formerly described as follows that was to say All that piece or parcel of enclosed ground late parcel of the waste ground of the said Manor adjoining the Road or Highway between Crow Street Green and West End Green and containing in length from East to West 131 feet of assize little more or less and in width from North to South 52 feet of assize being 50 feet at the East end and 44 feet at the West end thereof with two cottages or tenements set up and erected thereon by Joseph Heard called 'Trotts' to the use of the said S. Baxendale, his heirs and assigns for ever. 1898 Sept 2nd By Indre of this date made between said Salisbury Baxendale of one part and William Holland and Alfred Slapps Barrett therein described as carrying on business as grocers and provision merchants at Bishops Stortford in the County of Hertford under the style or firm of Holland & Barrett of the other part after reciting the hereinbefore abstracted Indre of 29th September 1884 ... First All That messuage or tenement with the warehouse, washhouse, oil store, yard and garden thereto belonging situate at Henham in the County of Essex by the side of the road leading from Henham to Chickney formerly in the occupation of ... Eggleton and then of said W. Holland and A.S. Barrett bounded towards the east and west by other property belonging to said S. Baxendale but then recently contracted to be sold to the Trustees of Mount Lodge No.105 Essex District Branch of the Wisbech Unity of the Loyal Order of Ancient Shepherds towards the North by the said road and towards the South in part of the said hereditaments thereinafter described and in other part by property belonging to said W.S. Poole and known as 'Henleys' which premises were more particularly delineated in the plan drawn in the margin of now abstracting Indre being then distinguished by a pink colour. 1906 30th. Nov. Abstract of title of Mr. Thomas Wright to freehold hereditaments at Henham in the County of Essex. 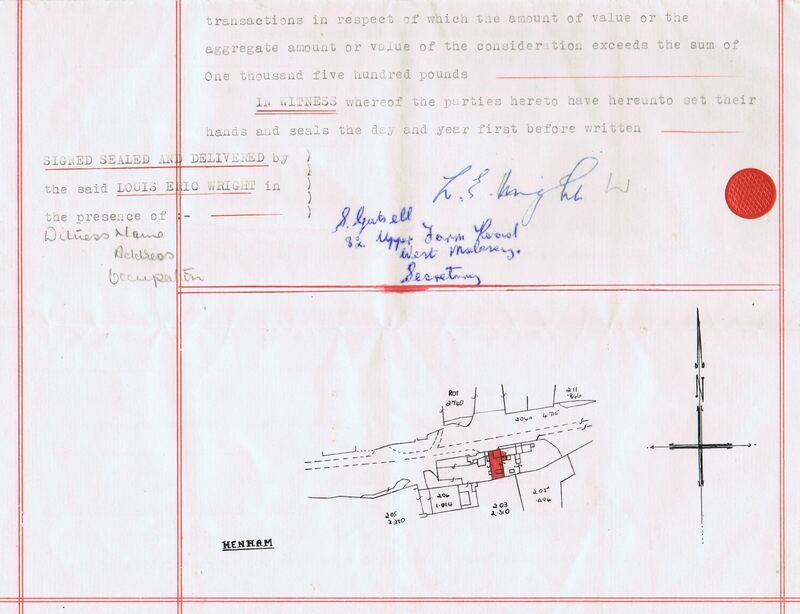 This document contains a reference on page 5 which records that 'Henleys' formerly belonged to William Sanford Poole. By conveyance of this date made between Thomas Wright of Henham in the County of Essex, retired boot maker, of the one part and Frank Charles Wright of Henham aforesaid, boot maker, of the other part. 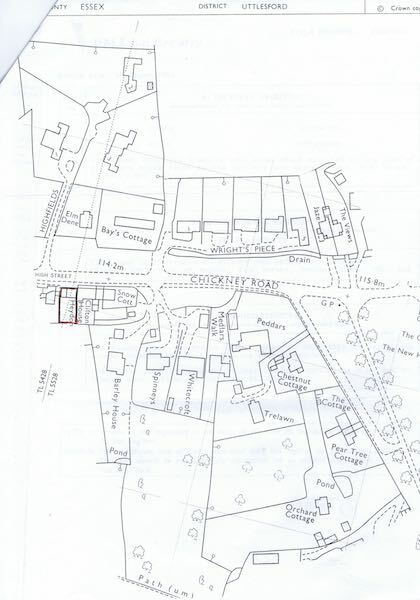 All that messuage or tenement with the shop, stable, yard, coach-house thereunto belonging site and being at Henham aforesaid on the south side of the road leading from Henham to Chickney to which it had a frontage of 38 feet or thereabouts and a depth therefrom of 72 feet or thereabouts butting on or towards the north by the said road on or towards the south by hereditaments of William Newman on or towards the east by or that of the said T. Wright on or towards the west by hereditaments of the trustees of Mount Lodge No.105 Essex District Branch of the Ashton Unity of the Loyal Order of Ancient Shepherds all which premises were then in the occupation of the said F. C. Wright except and reserving unto the said T. Wright, his heirs, administrators and assigns the owners and occupiers of the hereditaments of the said T. Wright abutting on the eastern side of the hereditaments thereby granted in common with the said F.C. Wright, his heirs and assigns and the owners and occupiers for the time being of the hereditaments thereby granted at all times thereafter and for all purposes to resort to and use the pump with situated on the hereditaments thereby granted the said T. Wright, his heirs, executors, administrators and assigns from time to time paying one equal moiety with the said F. C. Wright, his heirs, executors, administrators and assigns of the executors of keeping the said pump in repair………..
10th March 1944 – on this date F.C. Wright died at Haymeads Hospital, Bishops Stortford, Herts. By assent dated 24th Aug. 1944 L. E. Wright assented to the investing in Alice E. Wright of a messuage shop and premises in Chickney Road, Henham, Essex …. 1950 29th. 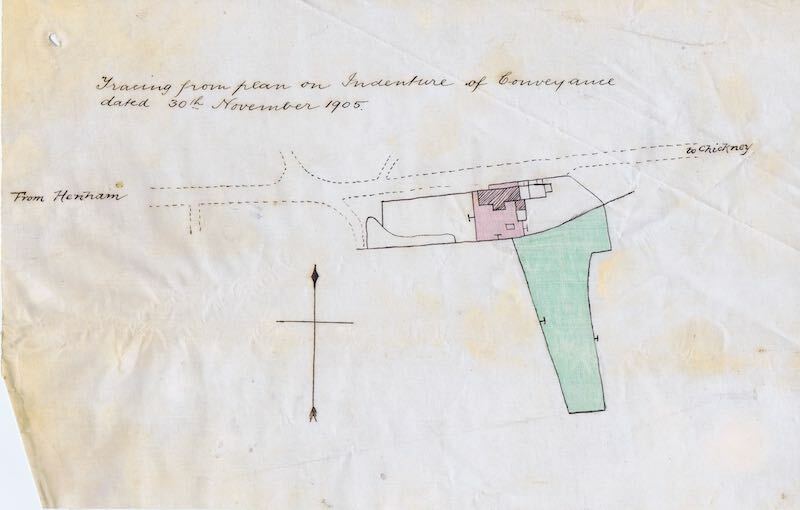 Sept. CONVEYANCE between Louis Eric Wright of 'Pantiles', West End Lane, Esher in the County of Surrey, company director (hereinafter called 'the vendor') of the one part and Edward Jenkins of 30, South Road, Saffron Walden in the County of Essex (hereinafter called 'the Purchaser') of the other part. 1. 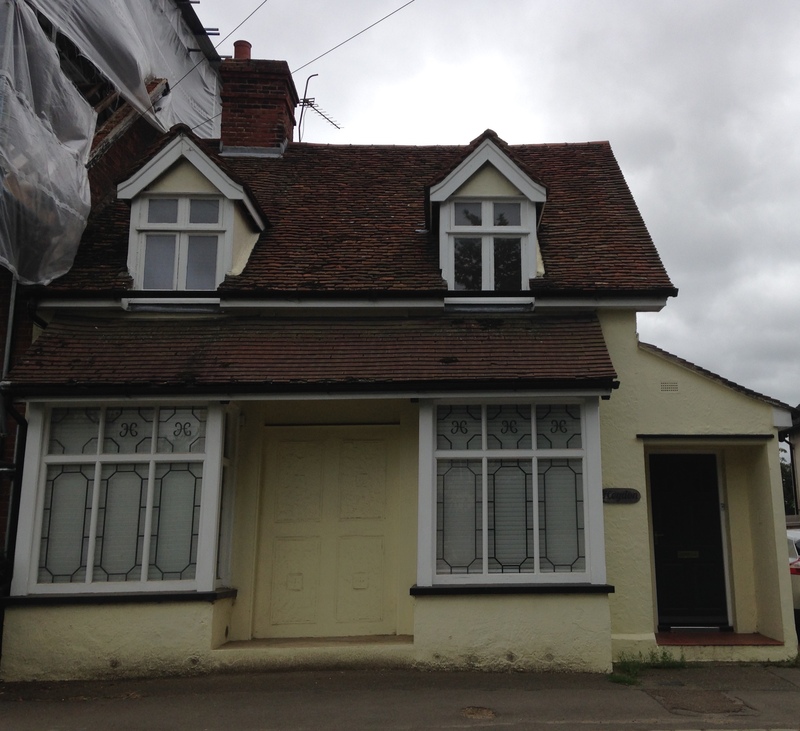 Whereas Alice Elizabeth Wright late of Chickney Road, Henham in the County of Essex, widow (hereinafter called 'the Testatrix') died on the 20th day of August one thousand nine hundred and forty nine (at Western House, Ware, Herts.) having by her Will dated the 26th day of July 1944 appointed her sons Cyril Thomas Charles Wright, Louis Eric Wright and Brian Aubrey Wright to be Executors thereof which said Will was duly proved by the vendor ... on the 17th day of November 1949 in the Principal Probate Registry. 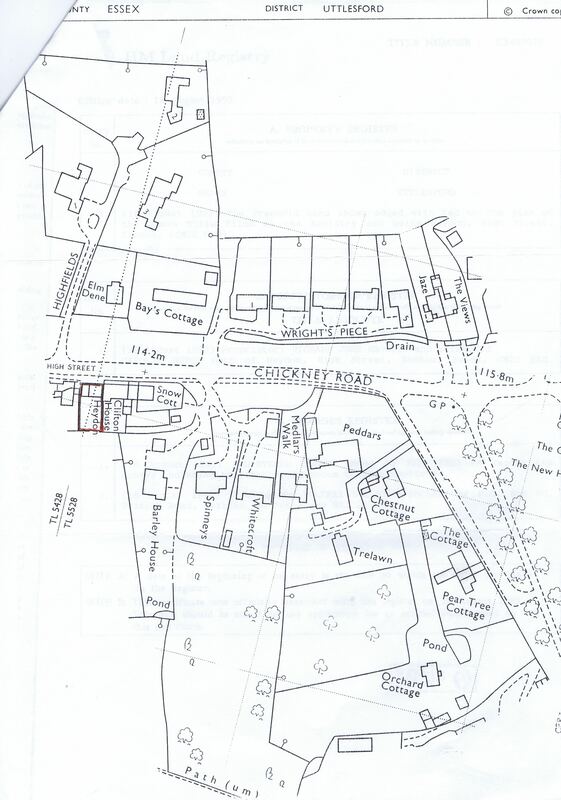 1993 18th Aug. HM Land Registry document and plan for part of Henham including 'Heydon' in the High Street, Henham. 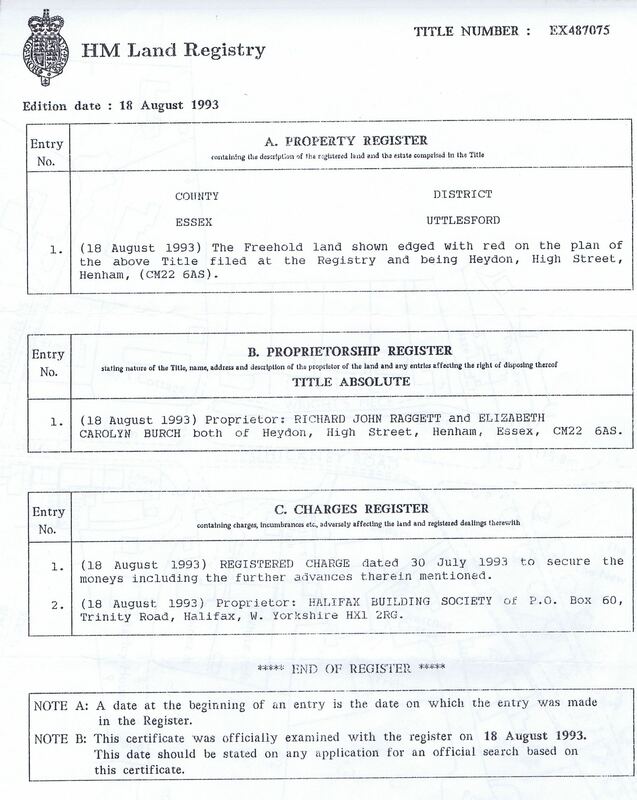 The proprietors were Richard John Raggett and Elizabeth Carolyn Burch both of this address.